Some anthropologists say that sharing food is what makes us human. There’s nothing else we do that is so central to making us feel part of a group. Sharing food is an opportunity to physically support each other and to share companionship through mealtime conversation. A companion, deriving from the Spanish “con pan” meaning “with bread”, is someone with whom to share your bread. 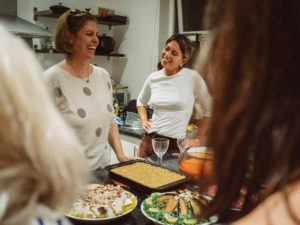 Research shows that the tradition of eating together as a family or group is far less common in Western countries than in other parts of the world. 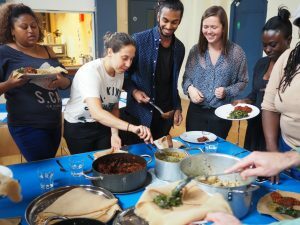 I never truly appreciated the power of communal eating before I started working on Migrateful: a social enterprise where asylum seekers, refugees and migrants teach their traditional cuisines to paying customers. 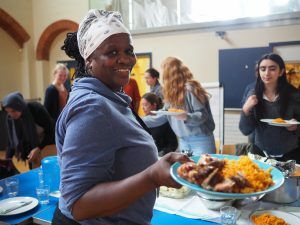 Last year I facilitated a Time Bank (community skill exchange project) in Tower Hamlets. The migrant and refugee women attending my English conversation class were asked to teach the community a skill in return for attending the class. After some thought, they told me “Jess, we could teach people to cook”. This was where the Migrateful idea began. Every Wednesday at the Migrateful chef training, the chefs take it in turns to teach the group how to prepare their cuisine. We currently have chefs from Syria, Iran, Lebanon, Nigeria, Eritrea, Ethiopia, Ghana, Ecuador, Cuba and Pakistan. As we sit around the table to eat there is a sense of companionship and joy in the room. We are all excited to celebrate the cuisine of our new friend. Asal was forced to leave Iran with her children after the political situation became too dangerous. She had trained for seven years as a psychologist there and despite gaining refugee status in the UK, has struggled to find employment due to language barriers and her qualifications not being recognised. She explained: “It’s hard to stay positive through it all. It’s about finding your purpose again. 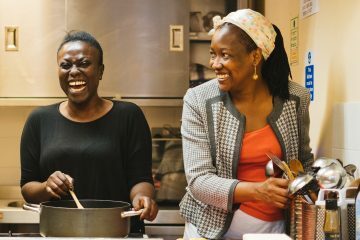 Migrateful is really helping – I am sharing my cooking skills with love and passion again. A lot of my happiest memories are associated with food – In Iran I remember waking up to the beautiful aromas of my grandmother’s cooking”. Majeda who arrived to the UK three months ago, was working as a children’s therapist when the war broke out in Syria. Thousands of displaced Syrians were arriving to the capital where she lived having had their homes bombed by the Syrian government. Majeda organised an initiative to feed them. The Syrian government then imprisoned her for four months, with the reasoning: “it is a crime to feed the Syrians from areas occupied by the opposition – we want to leave them to die”. After she was let out she continued her support for the internally displaced. Eventually threats from the state became too much for Majeda and her family. She explained: “it was so hard to leave Syria, but I had to do it to protect my family. I wish I were in Syria now, I know my country needs me and I miss my two boys and husband so much”. 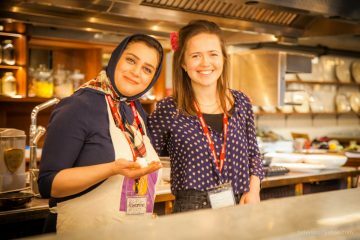 Majeda lead an incredible Syrian cookery class for us last week. 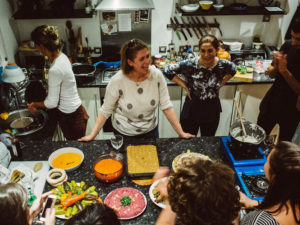 She told the group “I believe there is a relationship between cooking and love and that preparing a meal for the one you love, combining your skills and your feelings to create something, can convey a lot to the person. I have a real passion for cooking and I think that passion is one of the things that makes me a good wife, Mum and friend”. When she made this speech I felt moved to tears. She skypes her two boys everyday before breakfast, lunch and dinner, and I know she would do anything to be able to cook for them, and instead here she was cooking for us so lovingly. Yohna was imprisoned and tortured by the Eritrean state for her Christian faith. She explained: “After I was imprisoned, my uncle helped me to escape the country. I think he was killed for helping me. I haven’t heard from most of my family and friends since, many of them didn’t survive”. 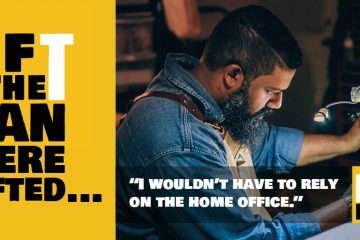 When she arrived to the UK 12 years ago her asylum claim was rejected and she is still awaiting the Home Office’s decision. With no state benefits and without the right to work she was left to sleep on the streets, until the charity Housing Justice found her a host family. Yohna told me “Jess I am so happy to have found the migrateful cookery group. Eating together in a group is so important to me. In Eritrea every day I would eat with my family and friends using our hands out of the same big plate, those are some of my happiest memories. 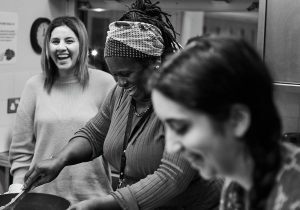 Migrateful has helped me to feel more positive about myself, to realise I have a lot to offer, it’s so nice that others want to learn about my cooking”. Before eating, I asked the group to share something they felt grateful for. Yohna shared with us a beautiful story of reunion: “This week I met my long lost best friend in Stockwell station. I thought he was dead. It turns out the government killed his family but not him! I hadn’t seen him for 20 years. He cried out “Yohna” on the escalator and I turned around, as soon as I saw his face I knew it was him, and I shouted “Danny!” We both couldn’t stop crying and hugging for hours. He is like my family. And now I have found him!” After this ritual of gratitude, Majeda said “Tfaddalow! – Translation: please join us to eat!” and we tucked into some delicious Syrian food.